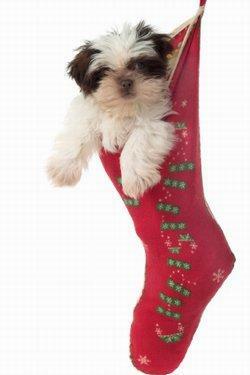 If you're bringing a new furry friend home this holiday season, don't forget about Christmas puppy stockings. Dogs might not have a clue about the holidays, but they still appreciate receiving a tasty treat and a toy or two. Christmas puppy stockings make a great gift to accompany a brand new friend coming home during the holidays, but your current dogs will appreciate one too. Putting together your own puppy Christmas stocking is easier than you think and more fun than you might expect. Let's take it one step at a time. First, you need to select the stocking you want to fill. During the holiday season, most malls, department stores and toy shops offer a large selection of stockings in a wide range of colors and sizes. You'll probably even find them at your favorite pet supply.Most of the stockings offered will come blank, so the next step is to personalize your choice with your puppy's name. If you're bringing home a new puppy that hasn't been named yet, you just might want to choose a stocking that simply says "Dog" on the cuff. However, if you already have a name in mind, or if the stocking is for a current family pet, you'll want to have the name added on. You can go about this in several ways. If you're lucky, the store where you're shopping may offer free embroidering with your purchase. This is a great way to get a professionally customized look. You can visit your local craft or fabric store and purchase iron-on letters to customize your puppy's Christmas stocking. You can also add your dog's name with puff fabric paint. Finally, you can personalize your pet's sock by writing her name with fabric glue and sprinkling glitter over the top. When the glue dries, just shake off the excess glitter and you have your finished sock. This method actually works a little better than using glitter glue, which tends to quickly peel off. Drs. Foster and Smith: Have a lovely stocking personalized with your puppy's name. Kissed by Dogs: This site offers beautiful needlepoint stockings by breed. Homemade dog treats baked with your own hands are a terrific choice. Try recipes like Apple Crisp Dog Biscuits and Slice and Bake Dog Cookies. Toys, such as Kongs and stuffed lamb's wool animals make safe, yet fun toys for dogs of all ages. Chew toys are always a great favorite with puppies. Good choices include Nylabones, Greenies and USA manufactured rawhide bones or other dog bone treats. Grooming supplies like a good brush, comb and toothbrush can help fill in any room you have left. Tip: It's easy to get carried away and purchase too many items to fit into your stocking. If you ask at the main service desk, many shops will allow you to bring your puppy stocking in with you so you can experiment filling it with your selected goodies. If you're rushed for time or you just don't want to worry about giving your dog's stocking the full Martha Stewart treatment, no problem. There are dozens of pre-made Christmas puppy stockings filled with treats that are sure to entertain any lucky dog that receives one. Let's look at a few selections. A visit to i-Pets.com reveals a good selection of pre-filled dog Christmas "stockings" at inexpensive prices. You can choose your gift in sizes than run from small through extra-large. Each sock-styled package is filled with an assortment of rawhide chew treats. Foster and Smith offers holiday pet stockings that include an assortment of treats and vinyl toys. You can choose packages that range from $10.00 to $20.00. 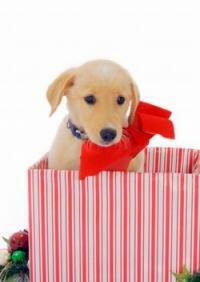 Whether you're looking for pre-filled or empty holiday pet stockings, BisRate.com has plenty to offer. Once you've prepared your puppy's holiday treat, you need a way to hang it. Rather than damaging your mantle, why not consider using a stocking holder? You can find a variety of attractive stocking holders at many pet supply stores and at online retailers such as PersonalizationMall.com. Now you know everything you need to know to put together a great Christmas stocking for your pet. While you're at it, don't forget to visit LTK's adorable Christmas dog slideshow to help you get into the holiday spirit.